When the OPTIONS button is selected, the Import Options dialog appears. Once the dialog options have been configured and accepted, the selected file is then imported. 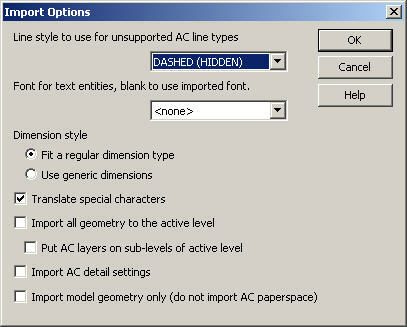 Line style to use for unsupported AC line types - AC (that is, AutoCAD) line types will import as the line type specified in this field. Choose a line type from the list box. You can choose from continuous, dashed, center, or phantom; continuous is the default. If no AutoCAD line type can be translated, the default line type is used. Font for text entities, blank to use imported font - This option allows you to select a single font to which all fonts in the export file will be converted. To export each text with its own font, clear the text from this box. Dimension Style - Set this option to either fit for dimensions to import as the closest dimension type, or as Gendim. These dimensions will be easier to modify, but may not look the same as they do in AutoCAD. Dimensions imported as Gendim retain their AutoCAD look, but are harder to modify and cannot be exported as a Dimension entity. When 2D Polyline, Arc, Line, and Point are imported with Dimension set to Gendim, these entities will be generic dimension entities. Translate Special Characters - When this is checked, special symbol characters used by DWG/DXF files will be converted into their KeyCreator equivalent symbol. This means that double-byte font characters which use a given special symbol code for one of their bytes will not display properly. When unchecked, special symbol characters are not converted. Import all geometry to the active level - When selected, the geometry is imported to the KeyCreator file at the level that is active on the viewport. When cleared, the AC (AutoCad) levels are added as new levels in the KeyCreator file. Import AC detail settings – When selected, the settings on the KeyCreator Detail Options dialog (Detail>Settings>Settings) change to match the detail options in AC (AutoCad). When cleared, the settings on the Detail Options dialog are not changed when importing a .dwg or .dxf file.